Newer Model Available: AEIOmed Everest 2 Travel CPAP Machine. 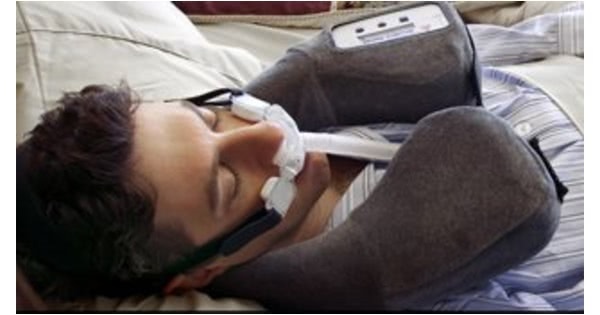 BreatheX is the CPAP that you can wear. There are no cords running from the wall to your machine and nothing on your nightstand. 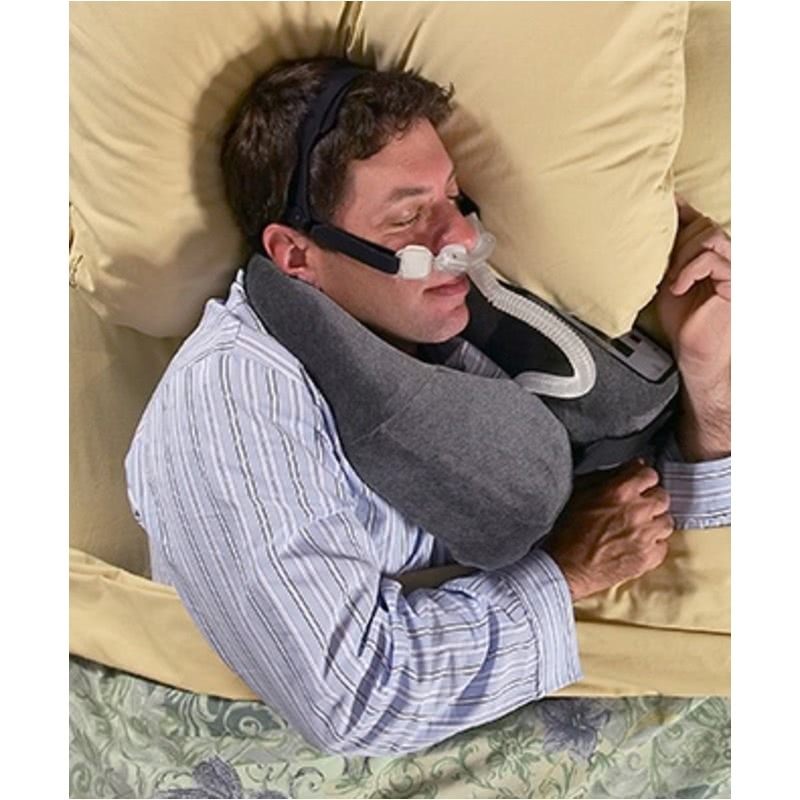 Instead, the CPAP is part of a soft airplane style pillow which can be worn or placed to your side as you sleep. 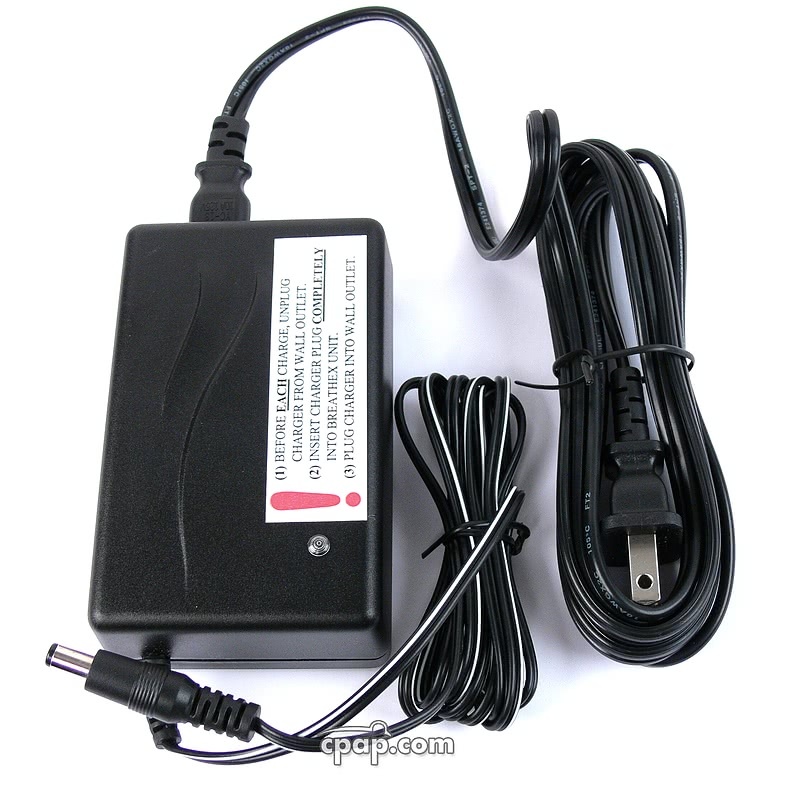 The battery, which powers the machine, lasts one to two nights before needing a recharge. BreatheX is a leap forward in CPAP technology. BreatheX is the completely battery-powered CPAP that you wear to bed. 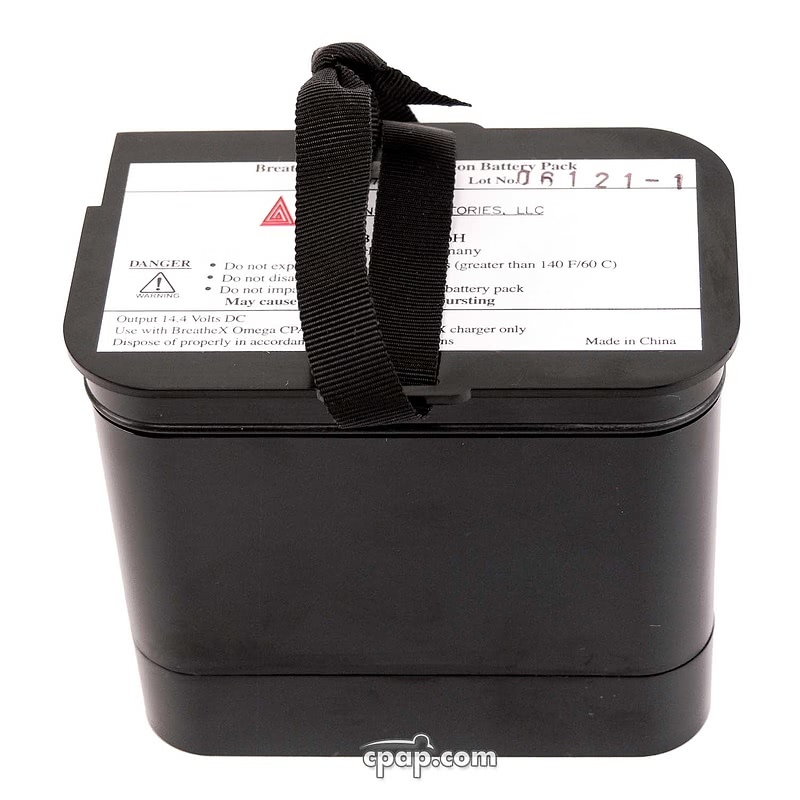 Campers, aircraft personnel, long-haul truck drivers, business and leisure travelers, boaters and anyone else looking for a travel friendly CPAP no longer need to worry about outlets and power sources. It's great for non-travelers, too. If you often get up in the night, BreatheX can go with you. It doesn't hamper you. It's just the thing for people who want to be free of long hoses, cords, and confined sleeping positions. Now, you can sleep anywhere you want, even your backyard hammock. 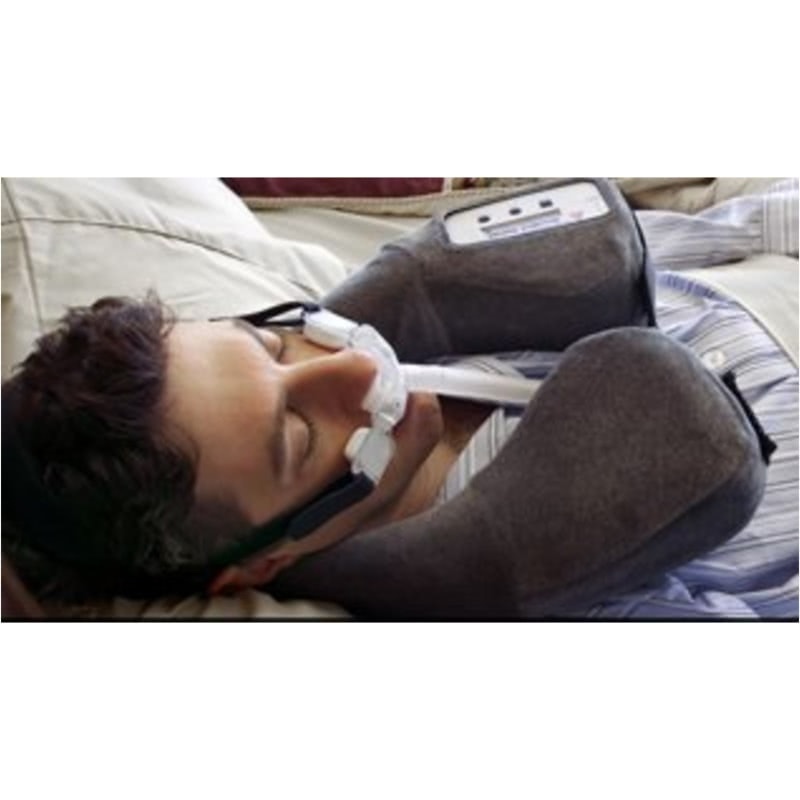 BreatheX is positioned inside a U-shaped neck pillow, like the pillows you see on airplanes. 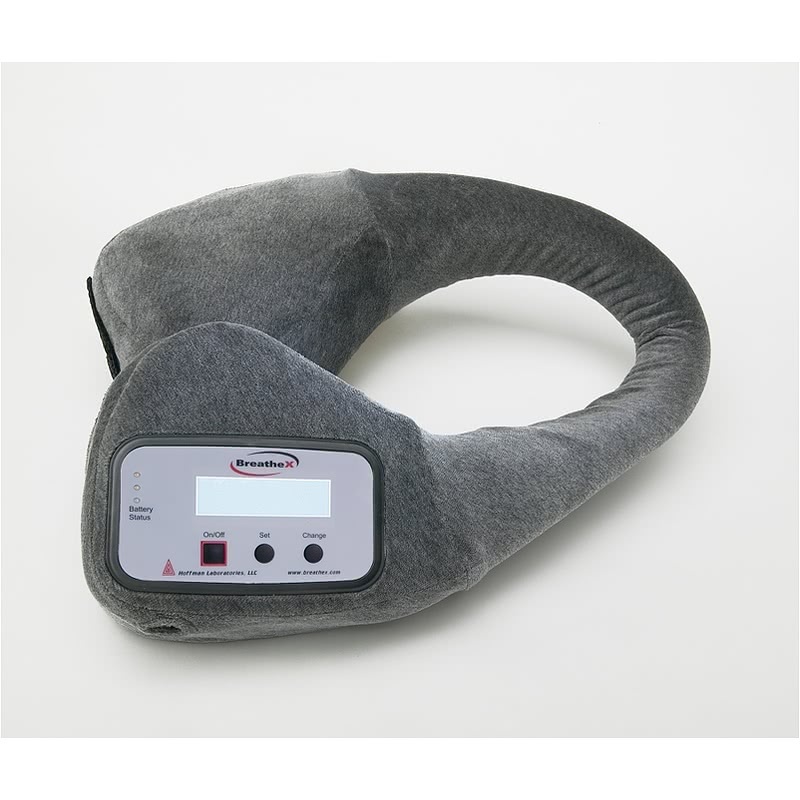 Made of soft memory foam, the pillow is ergonomically designed to be used in multiple positions. So you can wear it, or you can place it beside you, over you, wherever is most comfortable for you. You can use it anywhere you like. Even better, you'll no longer have medical equipment taking up half your nightstand. Because BreatheX is placed so close to you, you don't need the standard 6-foot tube, so there's no pulling, no yanking, no getting tangled. Sleep on your back, or on either side. And move around as much as you want, BreatheX is ideal for active sleepers. When you move, the entire system, CPAP and mask, moves with you. So if you're one of those sleepers who just can't stay still, BreatheX will return comfort to your movement. Best of all, it's compatible with just about any mask or nasal pillows system, so you can keep wearing your favorite interface. Unique Design Not "medical looking"
Masks pictured are not included with this product. 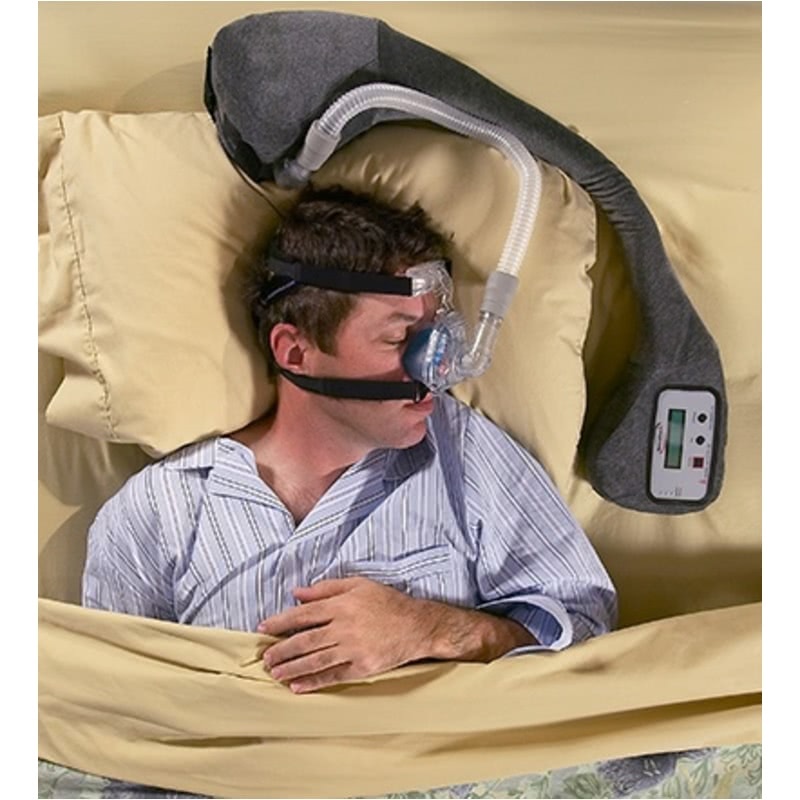 Nearly all CPAP masks currently on the market will function with this CPAP. 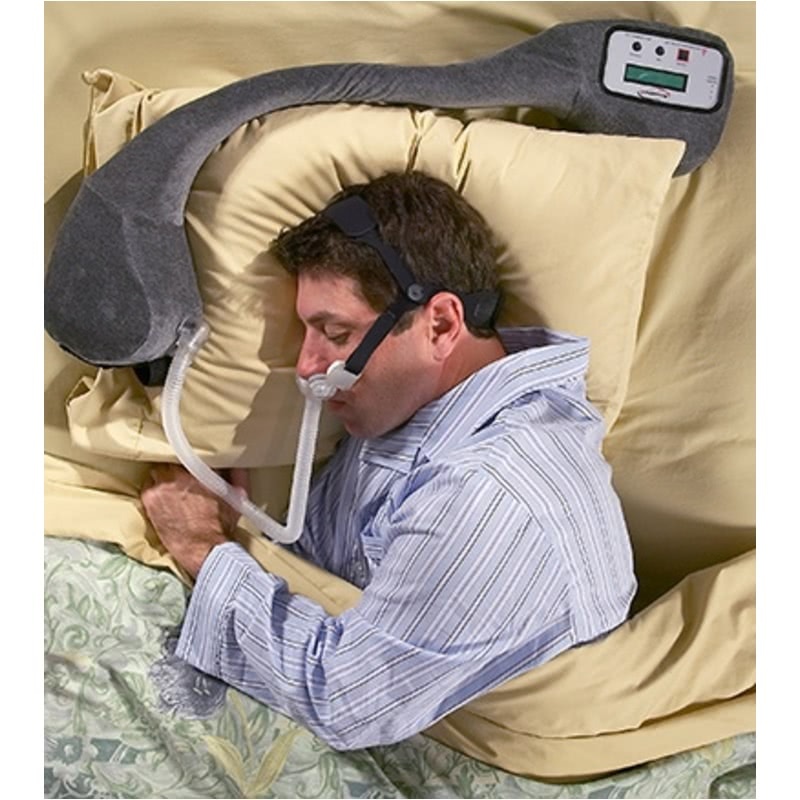 The ComfortCurve will not function with this CPAP. The BreatheX has a range of 5-12 cm H2o. If your pressure is above 12, this is not the CPAP for you. If your pressure is 12 or below, this is a unit that you should seriously consider. 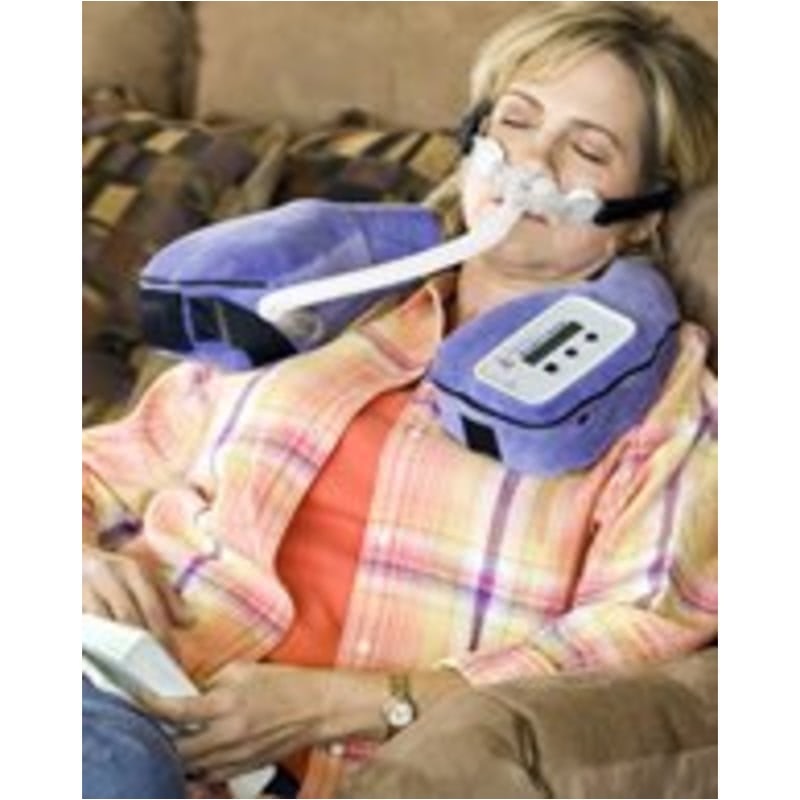 The user manual included with this machine can be viewed and downloaded here: BreatheX Battery Powered CPAP Machine. The BreatheX runs on its own internal 8 cell lithium Ion battery. 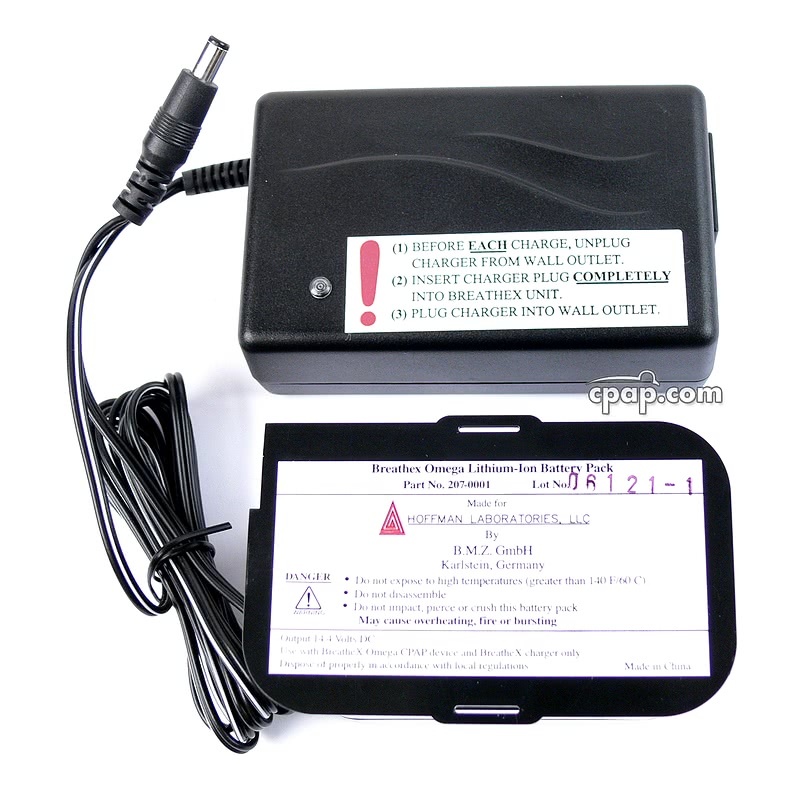 The internal battery can be recharged using either 110v or 220v shore power.